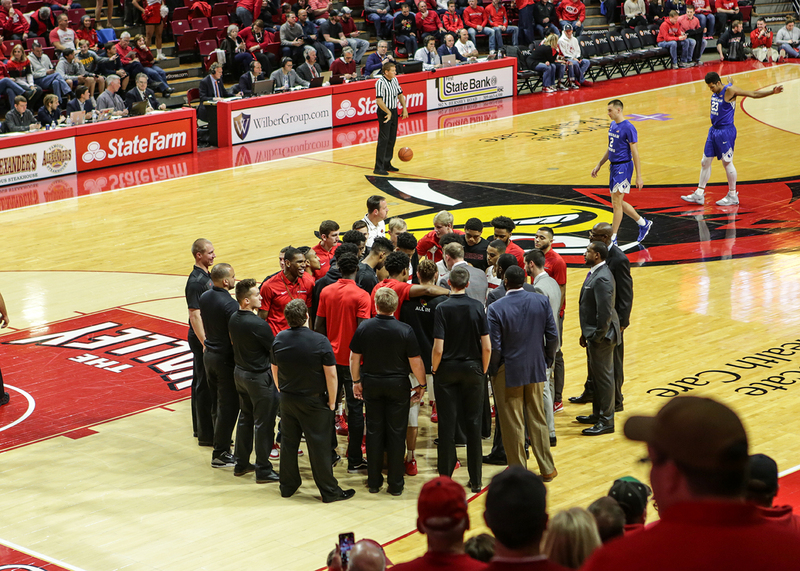 The student-managers form the middle section of the back line in this group shot of the 2018-2019 Illinois State University men's basketball team. Most Illinois State men’s basketball fans know the names of former greats like Doug Collins and Will Robinson, or current standouts Milik Yarbrough and Phil Fayne. But we’re guessing not many members of the Redbird faithful would recognize Garrett Grimsley if he were standing next to them. If Grimsley is unfamiliar to you, you’re not alone. The Illinois State junior has not recorded a single basket, assist, or rebound in an NCAA Division I game this season. Nevertheless, the junior has done something at Illinois State that none of his bigger name peers and predecessors have been able to accomplish: He has been part of an undefeated Redbird basketball team. Grimsley is the head student-manager for Illinois State’s men’s basketball. He and his fellow seven student-managers compose the Redbird managers’ team, which completed an unbeaten season last week. The Redbirds placed the capstone on their perfect run with a win over Southern Illinois University Carbondale’s managerial team. Redbird managers’ play games against teams formed by the managers of whichever team is next on the Illinois State men’s basketball team schedule. The managers usually play two 20-minute halves of 5-on-5, call-your-own-foul basketball the night before the “real” games. The Redbirds’ perfect season is impressive considering they sometimes play opponents rounded out with the other team’s coaches. Take the example of the Redbirds’ game against Valparaiso. That team featured a member of the 2002–2003 Marquette Final Four squad, which was led by NBA superstar Dwyane Wade. “The reason we have been successful this year is that we have been playing together for the last two or three years so we know what we can expect from one another anytime we play somebody else,” Grimsley said. Grimsley and the other Redbird managers have their eyes set on playing this Thursday, March 7, at the Enterprise Center in St. Louis, hours before the Missouri Valley Conference (MVC) tournament, aka Arch Madness, officially begins. The MVC managers’ teams will face off from 11 a.m.–1 p.m. in a 3-on-3 tournament dubbed Manager Madness. Just a few hours later the student-managers will be back in a supportive role as the Redbirds men’s team takes on Evansville in the opening round of the MVC tournament. The student-managers form the glue that holds the men’s basketball team together. Grimsley said he is happy to have the opportunity to back the ‘Birds at Arch Madness, where he and the other managers are confident the Redbirds will go deep into the tournament that will decide which MVC team automatically qualifies for the NCAA tournament. These Redbird managers are the unsung heroes of men’s basketball, taking on a variety of responsibilities, like working the clock at practices, aiding in workouts, organizing team meals, and dealing with whatever coaches or players may need on and off the court. Maintaining that connection to the sport is especially important for Grimsley, who hopes to one day go on to coach collegiate basketball. Grimsley said the experiences he has gained seeing all sides of a Division I program have been great learning opportunities to help hone his developing coaching skills. Follow @Redbird_MBB and Grimsley’s account on Twitter to see how the Redbird managers’ team fares at Manager Madness. Timothy Wyland can be reached at tjwylan@IllinoisState.edu.